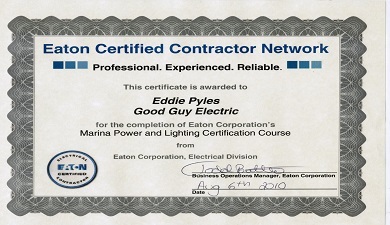 We are fully insured and licensed, and we are the first company to be certified under EATON MARINA and POWER LIGHTING. We have over 23 years of electrical experience, and of course, we hold a valid master electrician card with the states of Virginia and West Virginia. We provide a full range of marine electrical services for your boat lift, dock, or pier including post, walk way, and underwater lighting. We offer routine maintenance and repair services on boat lifts from grease fittings, to new cables, to replacement motors. We highly recommend a maintenance check at least once a year, but twice a year is preferred to prolong the life of the motors and keep your boat lift at its best quality of service. We are qualified to replace cable winders, motors, cables, belts, and all other parts to keep the boat lift in tip-top condition. We specialize in electrical panel upgrades and replacement (service upgrades). Make sure you use a qualified electrician for your service upgrade. There have been many times, throughout our many years in the electrical field, we replaced burned electrical panels from fire due to old breakers or the prior electrician did some improper work. Electrical fires are the leading cause to house fires, which is a hazard to people, property, pets, and etc... Most service upgrades are for increasing the amount of power coming in and the capacity for more things that the customer may desire.